Shop Twinings NEW collection of fantastically festive blends. This festive season, avoid the present buying conundrum and enjoy your Christmas shopping stress-free. Twinings has developed a brand new collection of classic blends and herbal infusions so that you can shop easily and give the gift of a heart-warming, full flavour cup that's perfect for sharing those festive moments over once the get-togethers begin. From Liquorice Allsorts Earl Grey Tea Baubles to Christmas Cheer Loose Tea Caddies, there is something here to satisfy all your gifting needs or to even add a splash of yuletide sparkle to your own festive celebrations. So why not enjoy a pot with the family and a mince pie (or two!) as the nights draw in? Give your guests the opportunity to 'rock around the Christmas tree' to something a little different this year with a stunning NEW collection of three Whole Leaf Silky Pyramid Tea baubles. Choose from Liquorice Allsorts Earl Grey Tea, a playful twist on a Twinings Favourite; refreshing Mint Humbug, a fresh and light blend of Peppermint and Spearmint leaves or Jasmine Pearls Green Tea, a delicate far eastern favourite. Each bauble looks fantastically festive on the tree and guarantees to satisfy lovers of more adventurous seasonal blends this Christmas. 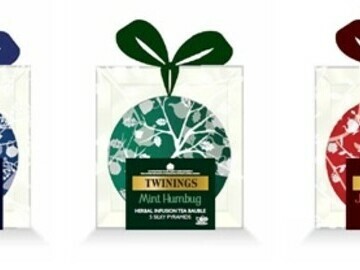 NEW Twinings Whole Leaf Silky Pyramid Tea Baubles start at £10 (MRRP). Get yours from August 2013 by direct purchase from Twinings Online Shop and other selected stores. 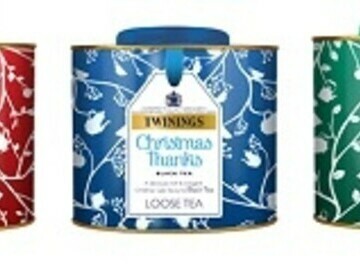 The Twinings Loose Tea Christmas Caddies sold out in 2012. Now, history is destined to repeat itself with these bright and festive gifts designed to sparkle on the kitchen counter. Choose from Christmas Cheer, a loving combination of malty full-bodied black tea from Assam and special Christmas flavours; Christmas Wishes, deliciously soft camomile blended with earthy rooibos and sweet pear for a comfortingly festive infusion... or Christmas Thanks, a deliciously fresh black tea blended with a light and fruity Christmas cake flavour. NEW Twinings Christmas Loose Tea Caddies start at £6.50 (MRRP). 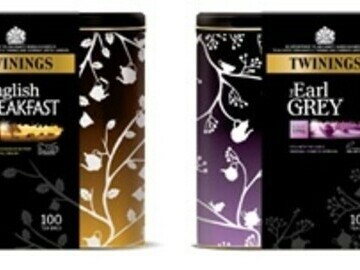 Get yours from August 2013 in Harrods, Waitrose, World Duty Free and by direct purchase from Twinings Online Shop. Christmas wouldn't be the same without tradition and many tea lovers will wake up to a steaming cup of English Breakfast or Earl Grey come 25th December. That's why we've packed 100 individual bags of these much-loved blends into two new Christmas Caddies at the same price as a standard box; an added gift from Twinings to you. As winter draws in and social gatherings pick up steam, a deliciously hot cup of English Breakfast can help put the world to rights at any time of day or night. Alternatively you can give this delightful Earl Grey Caddy, packed with your favourite tea, as a token of generosity to your friends and family...or you could always keep it for yourself! NEW Twinings Christmas Caddies start at £4.29 (MRRP). Get yours from October 2013 at all major retailers and by direct purchase from Twinings Online Shop. Here at Twinings, we like to talk about tea. That's because for us, it's more than just a drink. Our story began in 1706 when Thomas Twining challenged the rule that coffee was king and started selling tea from his coffee house on London's Strand. Since then it's been part of our daily lives and the lives of generations of tea lovers. We still sell tea from Thomas's shop and we still work hard to bring new blends to tea lovers. In fact, we have more expert blenders than any other company tasting more than 3,000 cups of tea every week. From store cupboard essentials such as Earl Grey and English Breakfast to aromatic fruit and herbal infusions, our glorious range of over 100 different varieties can now be enjoyed all over the world in 115 countries - and ten generations of the Twining family have seen it happen. In fact, Stephen Twining still works for his family's company today, helping to make sure that Thomas's promise is never broken. * For more information regarding media usage, ownership and rights please contact Rocket Pop PR.